look how cute you are! loving the "nerd chic" I'm so jealous you are wearing boots :) still way too hot here. You look adorable in plaid and those glasses! I love all the clashing styles, mixing high and low end fashion is a great idea for the fall! This look is simply perfect and I love everything you wear! Great! Aahhh, this is perfect! Exactly how I want to look, come fall. Those glasses are so fun, and the plaid + those boots = pure awesome. okay those boots are to die for! love them. 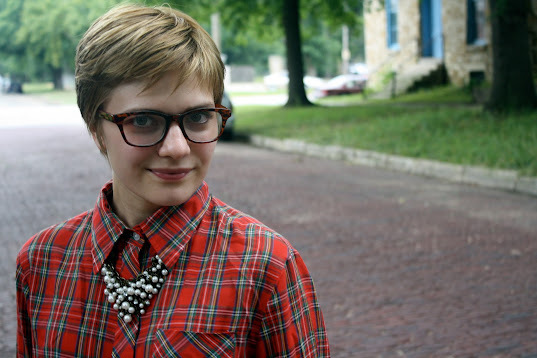 and i absolutely adore the combination between the plaid shirt and pearls. genius! i really like the shirt and skirt together! so far you are blowing fall out of the water! Love it and the blond highlights. I think the necklace throws in some glam too. good job on the mixin! Yay for pre-fall looks! Today is supposed to be a little cooler so I hope to wear something a little fall inspired but we'll see if the humidity creeps back up. Deets on the glasses? They are fab! Oh my. I think I just realized that when I was cutting my bangs I was subconsciously wishing I had a short do like yours. I see your bangs now and realize that that abstract picture in my head was actually yours. My new do looks nothing like yours, but Thought I would just let you know that images of you float around in my brain and tell me to do things. I even wore a shirt like this with a necklace like that over the weekend (didn't post it) and when I got here today I was a little bewildered. "how did she do that?" obviously we just have a similar aesthetic ideal. Makes me want to pay closer attention but at the same time, not, since obviously your pictures, once they go in they hide and quietly influence me. I am freaking crazy. I got the glasses from a store called Ragstock in Madison, WI. Those are fabulously structured boots. Gah, I can't wait for fall! This leaves me truly longing for the Fall! And I love that polish - what is it? This is such a lovely fall look. I adore the buttoned up shirt with the necklace layered over it. 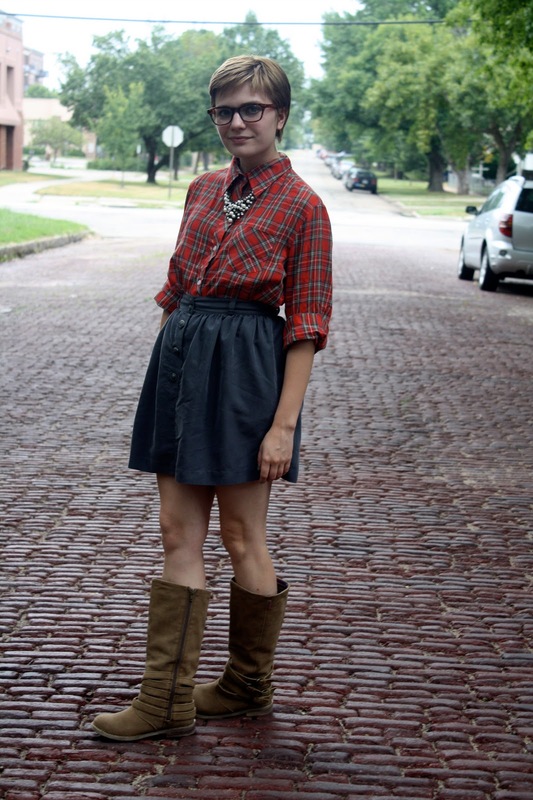 This post makes me want to pull out a pair of boots just in case the weather gets cool enough! It's Sally Hansen Insta-Dri in Mint Sprint. Love this! That necklace looks awesome on that shirt! I think i'm wearing the exact same shade of nail polish! I am loving this outfit, I wish it was cool enough in DC to wear my fall clothes! I'm also always coveting how little (compared to me) you spend on your clothes! I wish I was patient enough to be so thrifty! Thanks. :) I actually have Mint Sprint but hadn't tried it. It has definitely moved to the top of my list of back logged polishes to try out! Cravin' fall! You look amazing! this look just makes me LONG for fall, and i love your adorable kind-of-nerdy chic glasses. 2 kute!!!!! luv it gurlll!!! You look so cute in plaid! I love this look! Perfect for fall and work! Two things I have to pair together! Definitely an inspiration outfit!! how cute are you in those glasses!